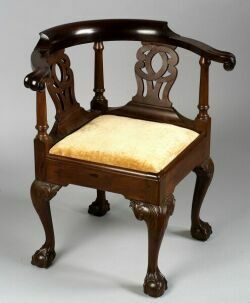 Chippendale Mahogany Roundabout Chair, Newport, Rhode Island, 1760-90, the curving crest ends in carved knuckled scrolled arms above the double "C" scrolled splats flanked by tapering baluster forms on a molded square seat with three leaf-carved and cross-hatched knees ending in ball and claw feet, the similar rear leg does not have carving, old refinish, (restoration), ht. 31 1/4 , seat ht. 17 3/4 in. 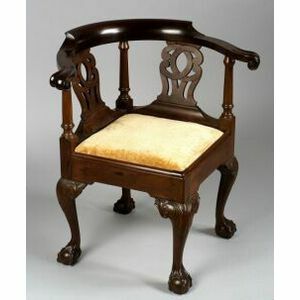 Provenance: John Kenneth Bayard, Norwalk, Connecticut.